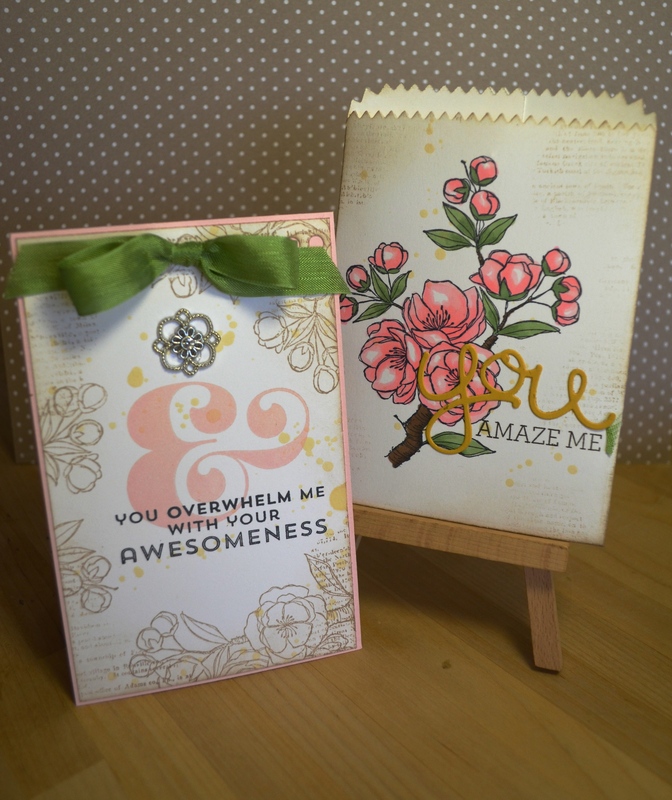 Artful Stampers Challenge- Crazy About You! 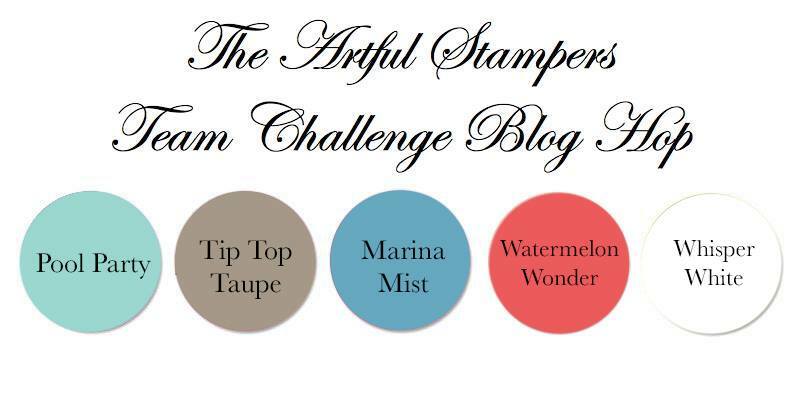 I have been meaning to do this for quite a while, and that’s to take part in an Artful Stampers Team Challenge. They are up to #48, so it seems I have missed quite a few. Hopefully I can keep this up for a while as I have missed being part of a challenge team, and just crafting in general. Now when I first saw this combo I was Hmmm….. maybe I should wait for next week! LOL. I have an aversion to Bright Green and Cucumber Crush falls in this category. I just don’t know what to do with it. But what’s a challenge if you aren’t really challenged, right?! I decided that I didn’t have to use much of the colour, but where ever I used it, it would pop. 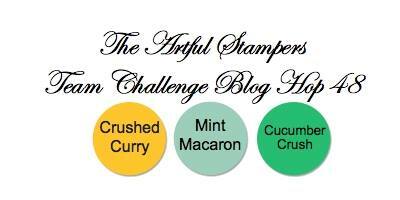 So the first step with a colour challenge is to find a stamp set that would suit it. I always find myself going for Nature themed stamps when I have the colour green in the combo. Maybe one day I will find another use the colour green. 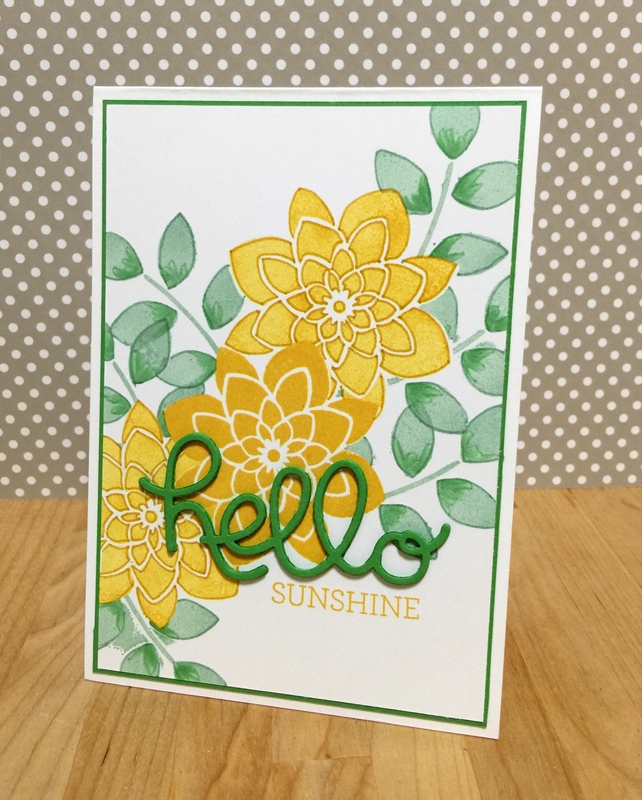 Last but not least the word ‘Sunshine’ was stamped underneath. You would have arrived from Alison Barclay’s Blog and you will go onto Anna Foster’s. Again it’s long time no post. I struggle to find the time to blog these days. I don’t even create as often as I used to. Things have changed in the Brown House, that’s for sure. The girls have become heavily involved in horse riding. They attend various clinics and competitions and our usual Pony Club rally days. So most weekends and some weekday afternoons are busy with that. I have this year become Treasurer of our local Pony Club and Vice President of the Primary School my youngest attend. I also volunteer in the Prep-2 classroom once a week, plus I am the uniform shop lady at the same school. I am also on the High School’s tuckshop roster. If that’s not enough, the boys will be starting soccer soon, so there is another item to add to the list. I really do need to organise myself better though, I have been known to triple booking my self on occasion. I now actually have two, yes 2, diaries on the go. One for my business and one for everything else. Maybe I should start putting in designated crafting time!! I have still managed to hold workshops here from home. I have missed a couple last month, but I am now back in business. I thought I would share with you one of the creations from last week. I have totally fallen in love with it and I hope it inspires you to create one too. 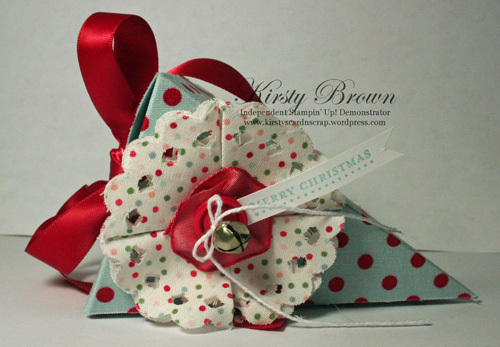 I had a play with the Mini Treat Bag Thinlits Die and turned it into a card pocket. 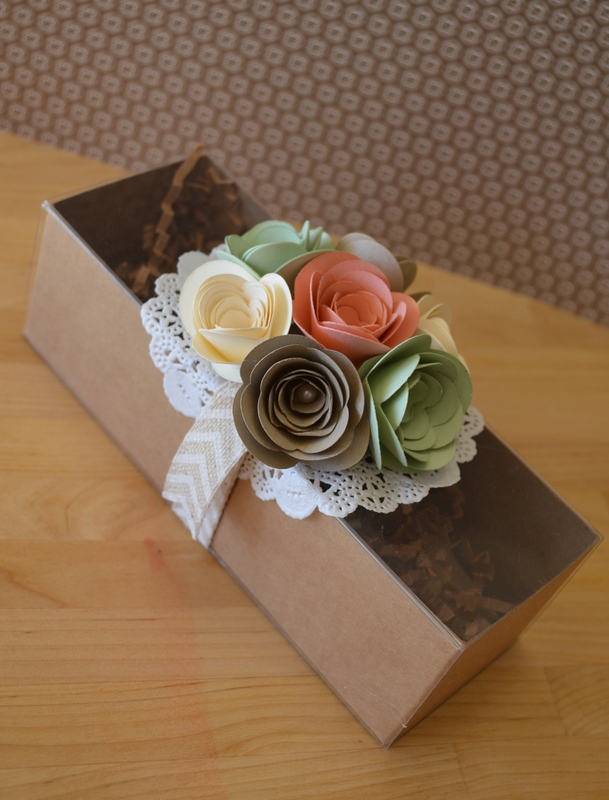 I also created a little coordinating gift box with the Tiny Treat Box. 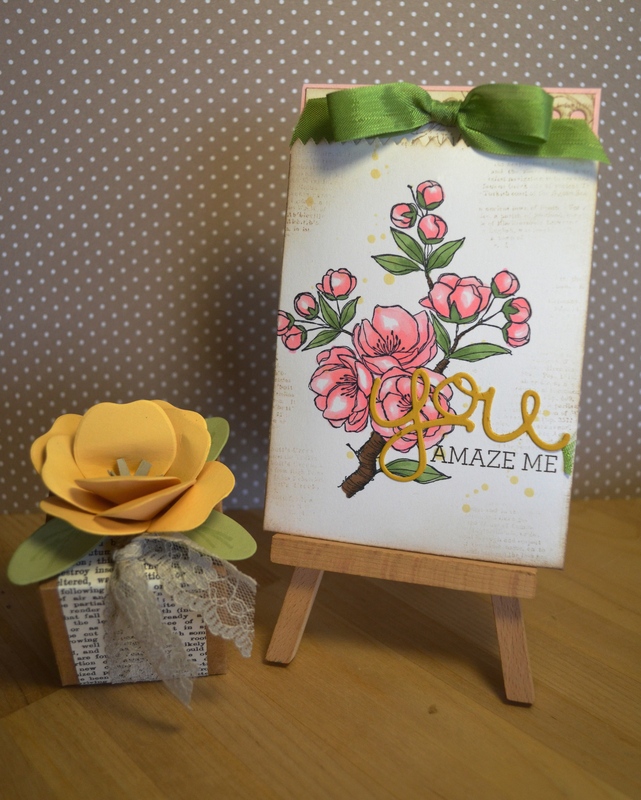 I used the Crazy About You Bundle to create the title and the delicious Indescribable Gift flower stamp for the image. We used our ‘blendies’ to colour it in. 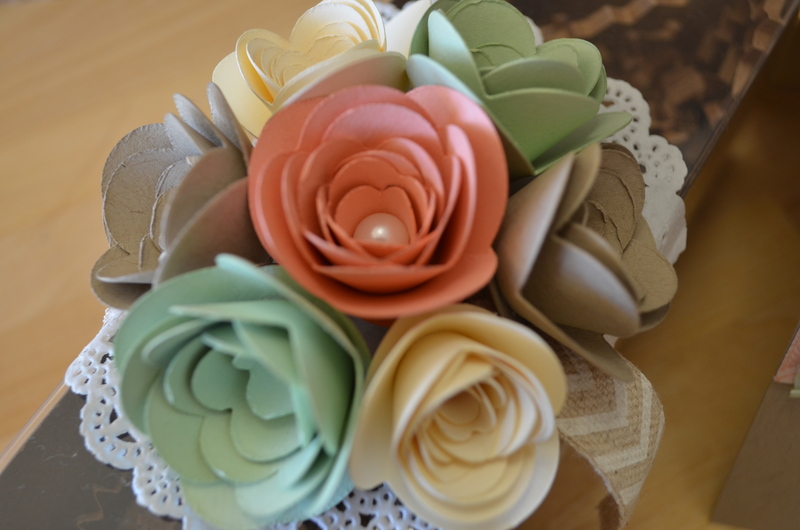 The beautiful Bouquet Bigz Die was used to create the flower. I have been meaning to get this post up for a while now, and I’m so glad I found time today to do it. 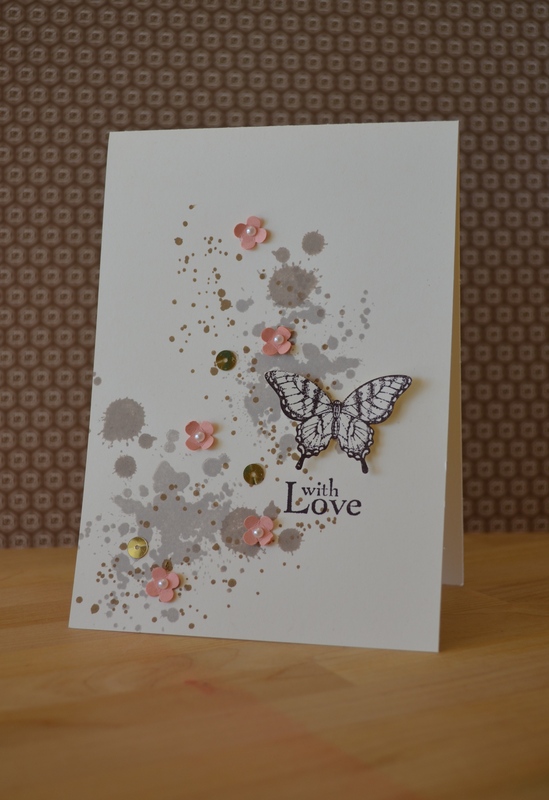 I had a workshop a couple of weeks ago with the special request of creating a wedding card. 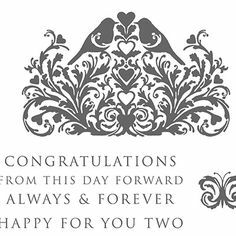 The only set I have in my many, many stamp sets suitable for a wedding card is This Day Forward. I loved this set from first laying eyes on it. As usual though the set had not yet seen ink! LOL……..until now that is. 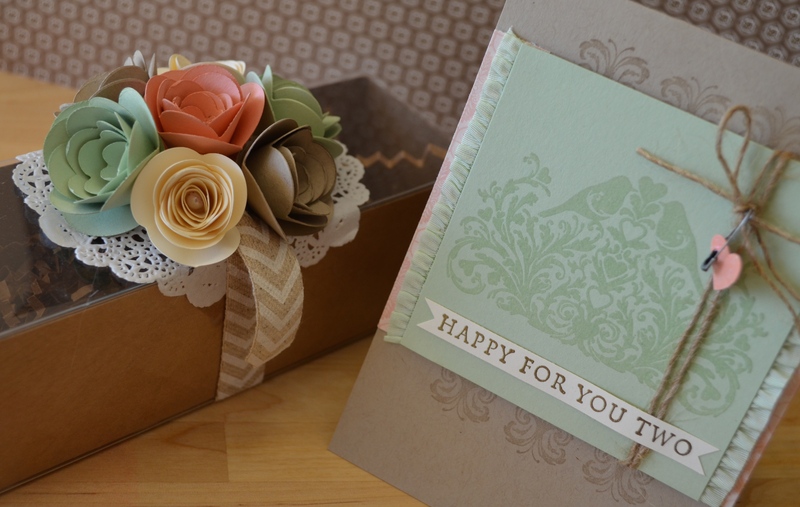 There was a beautiful box sample in the catalogue using this set and I decided to turn the same creation into a card. This is what I came up with. A very simple but elegant design. I loved it. I couldn’t stop there though, I decided this card needed a companion. I pulled out the Tag a Bag Gift Boxes and went from there. 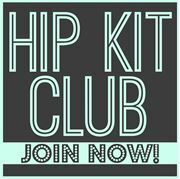 I was on Pinterest and found this lovely design by Stampin’ Club. 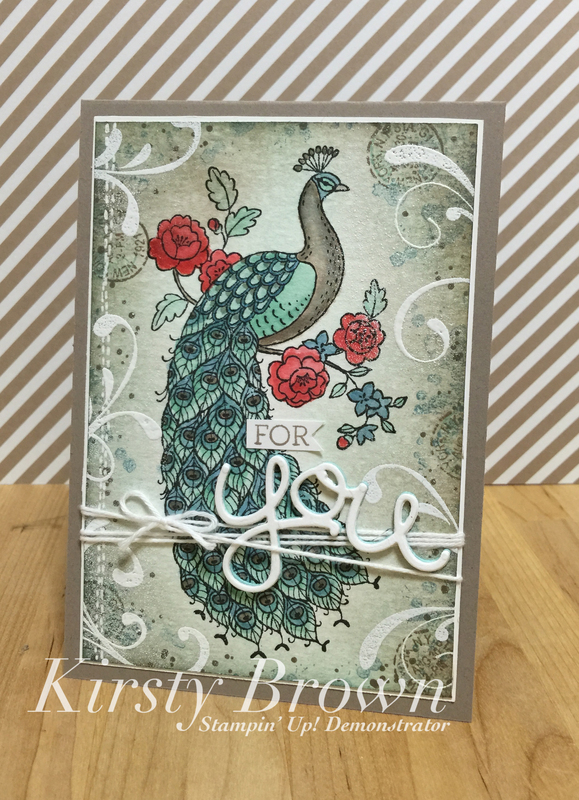 It is simply gorgeous and thought it complimented the card well. We also created one more card, a very easy card. I love those. I CASE’ed this card from somewhere. I thought it was Pinterest, but it wasn’t on my board, so now I’m not so sure. If you know who created this card please let me know so I can link them. Thanks! The original had a bigger butterfly stamp on it. That stamp was from the Best of 25yrs stamp promotion and the set was called the Best of Butterflies. EDIT TO ADD- The original has been found, thank you very much Corinna Buchan. Melissa Davies from RubberFUNatics is the original design I CASE’d. Go check it out. 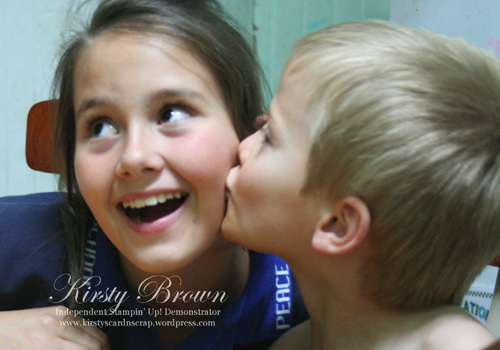 So as you can see we had lots of fun and I cannot wait to share the next workshop with you. It is Festive Friday Challenge time and our challenge this week was FABRIC!! 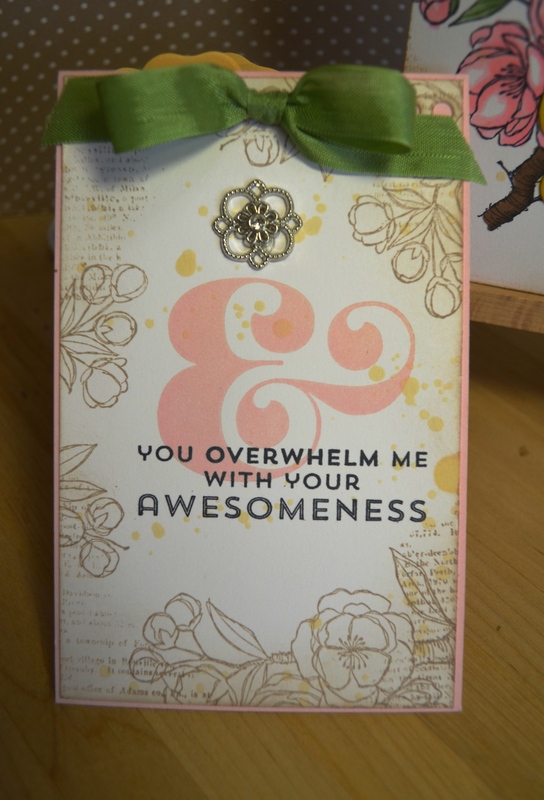 I must say I love our Stampin’ Up! Fabric, but I haven’t played with it too much. 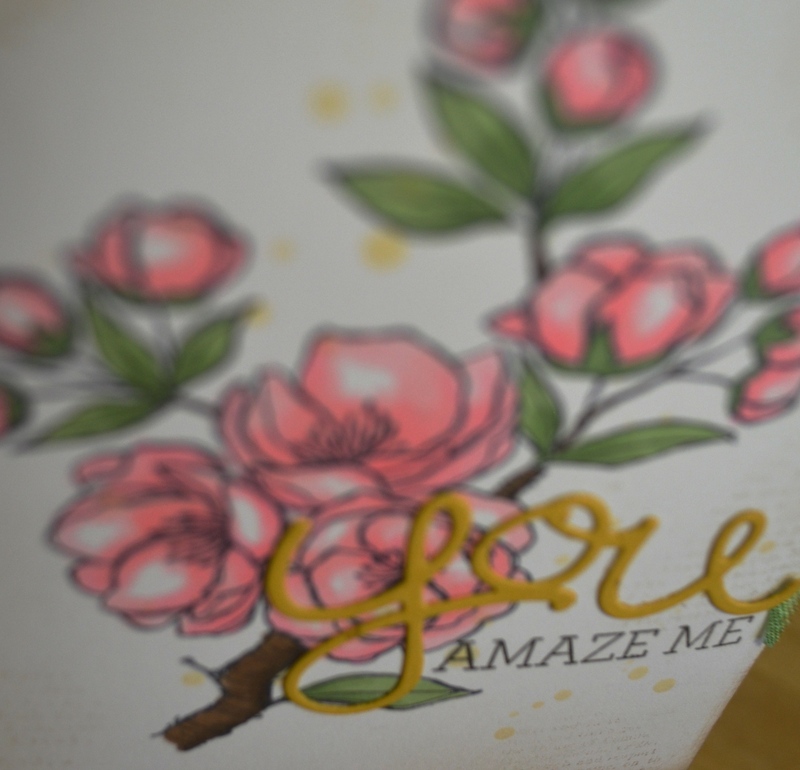 So to get some ideas of something different I can do with it I went looking through our Stampin’ Up! magazine Impressions. I came across this gorgeous little creation that I just had to re-create. 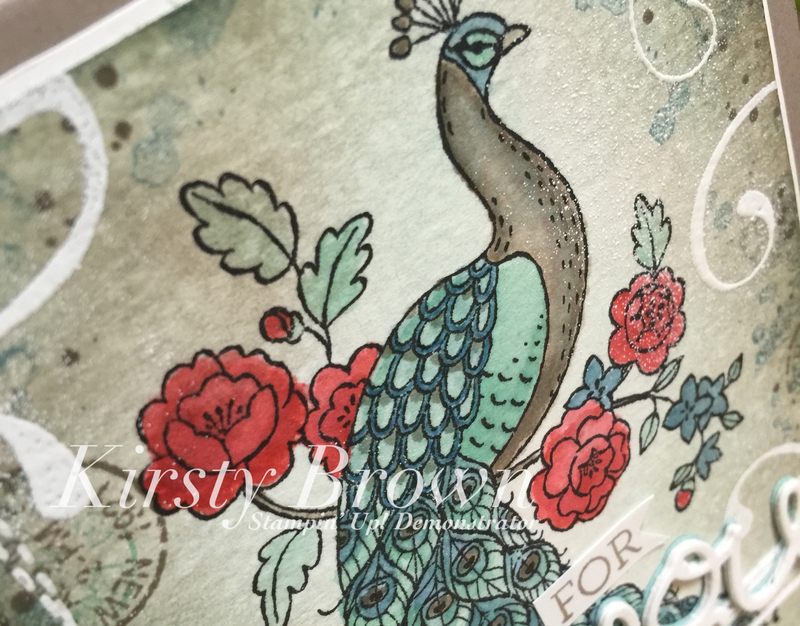 It so happened it used the Petal Cone die…..another product I haven’t played with much. So the plan was looking better and better by the minute. 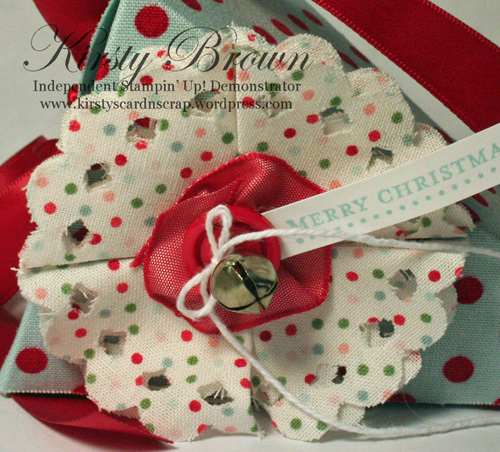 To make this I had to adhere the fabric to cardstock and then run it through the BigShot on the Petal Cone die. 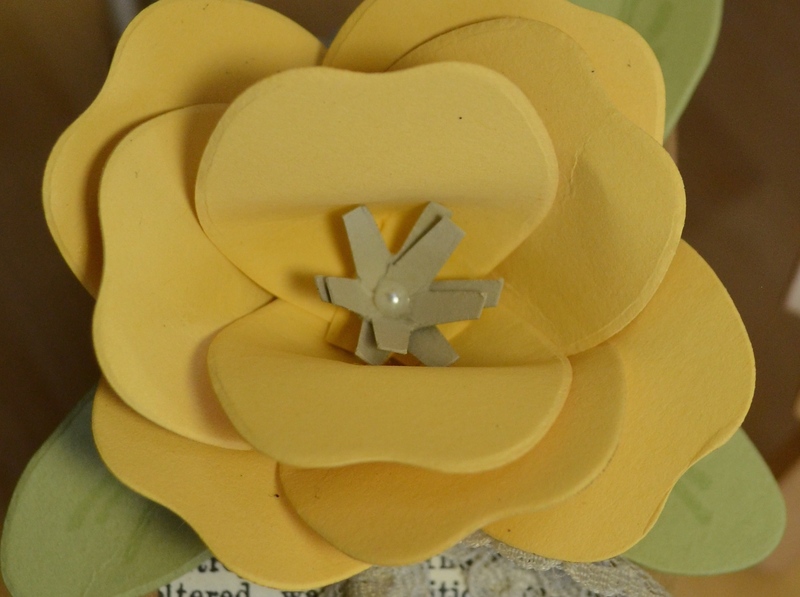 The flower on the front however is not adhered to cardstock. I diecut the larger flower shape from the Perfect Pennants die, I then folded them in half and half again. I used a hot iron to help me get the shape. I hot glued the four pieces to a 1 1/4″ circle cardstock. I must say I used the hot glue gun to do a lot of the adhering. Magic stuff that! LOL! The little silver bell is just tied on with the white thread through the Real Red button. But the button is hot glued! Anyway, please link your creation up at Nicole’s blog for us all to see. I would love to know what other people can do with fabric. 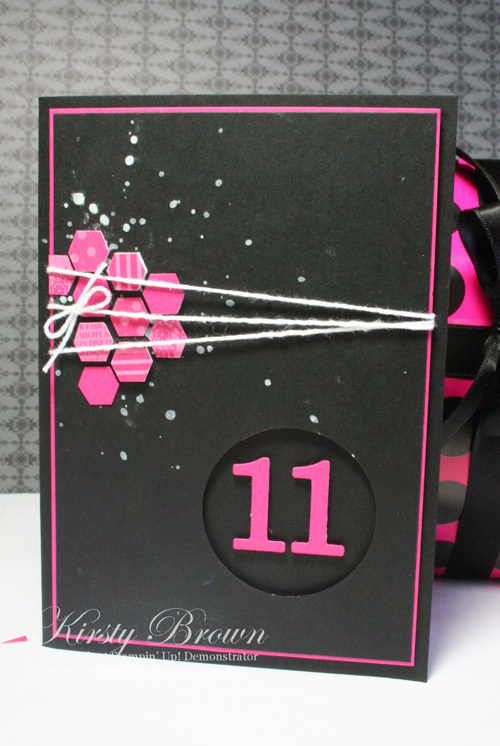 Lat year her favourite colour was purple, well this year it is black and pink. So her card and presents are decorated so. 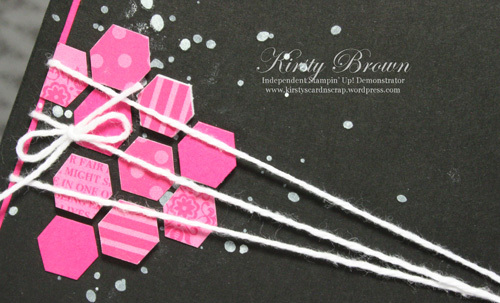 The ‘in’ thing lately seems to be hexagons, so I thought I would have a play with them on this card. 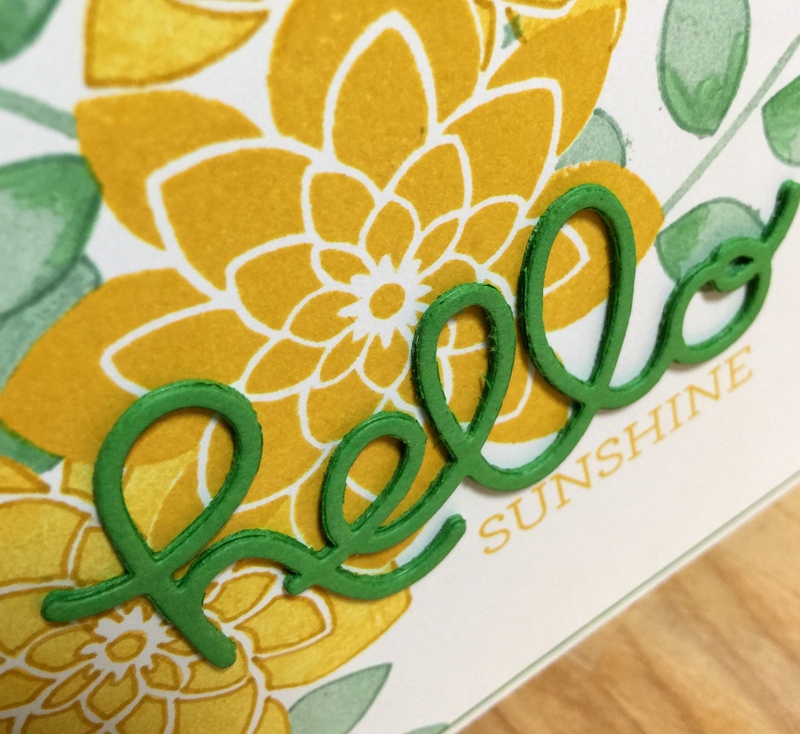 I don’t have any sort of hexagon punch or die so I knew I had to create these from scratch when I realised our Stampin’ Up! Dimensionals were the perfect size and shape. The splotches is just Whisper White ink refill being splattered over the left hand side of the card and I really like how that has turned out. I may have smudged a couple of drops but I was in such a hurry to finish as I have a few things to do today, being a birthday in the house and all. I have some more scrapping to show you. This one was a workshop LO I made last year. I love the simplicity of this one. But it has come together well. I used Well Worn DSP. 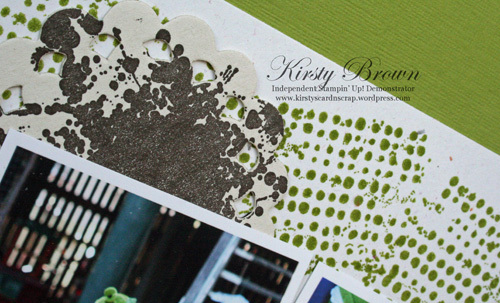 The base colour is Lucky Limeade with Confetti White. 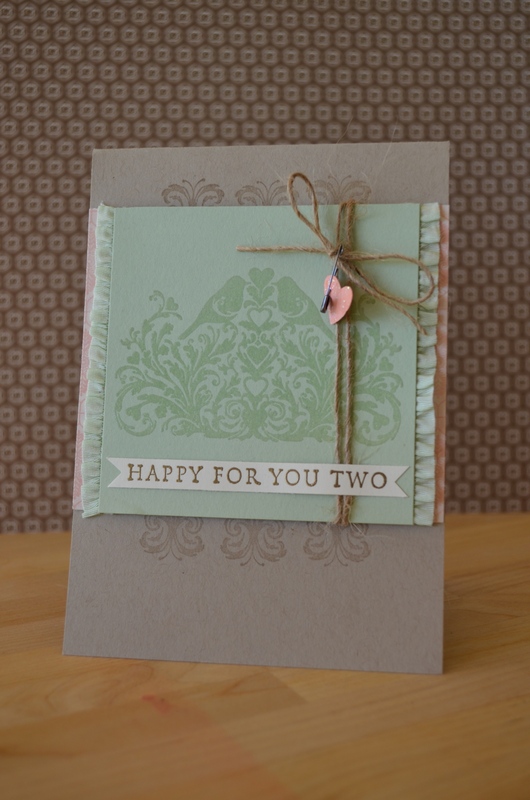 I used the Tasteful Trim die for the chipboard scallop edge and inked it in Early Espresso ink. 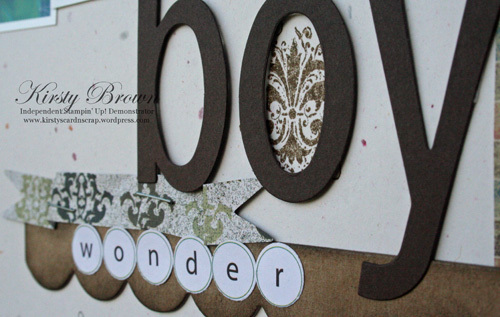 I used Simple Letters Alphabet for the ‘boy’ part of the title and Just Add Cake letter paper for ‘wonder’. 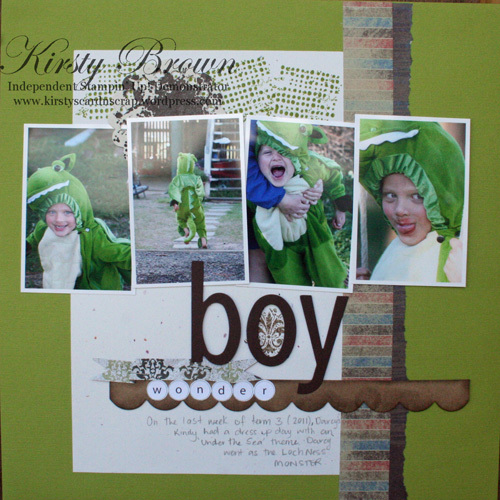 I used Extreme Elements stamp set and the colours Early Espresso and Lucky Limeade. I used the scallop circle out of Perfect Pennants and cut out a chipboard drinks coaster and then stamped the big blotchy splatter out of Extreme Elements over it and tucked it behind a photo. Hope I have invigorated you to crack open your scrapbooking! T hanks for dropping by!